Our host Mike Claudon, owner of Snake Mountain Boatworks LLC. and his craftsmen, John La Fountain (John)and Roger Towel (RJ) had a nice surprise for us. We were about to learn about polishing a varnish finish to perfection. John and RJ set the stage with a very nice 1949 13’.5” Lyman Leader as our lab “lab rat”. They had 7 coats of varnish on the deck with one side completed with a very nice gloss. The other side was varnished with 7 coats of varnish pre-sanded and ready for final sanding and polishing. John and RJ wet sanded by hand and with an orbital sander starting with 800, then 1,000 and finishing with 1,200 grit sand paper. This step is best performed after the varnish has cured (up to 30 days). During the process we discussed sanding between coats of varnish and we all seemed to agree that 3 or 4 coats can be applied and then sanded for another coat. Once the sanding and clean up was completed the “Ultra Finishing Polish” made by Meguire’s (Mirror Glaze 205) was appliedto the deck surface. The polish was then buffed with a foam pad on the polisher. The end result produced a very high gloss finish. 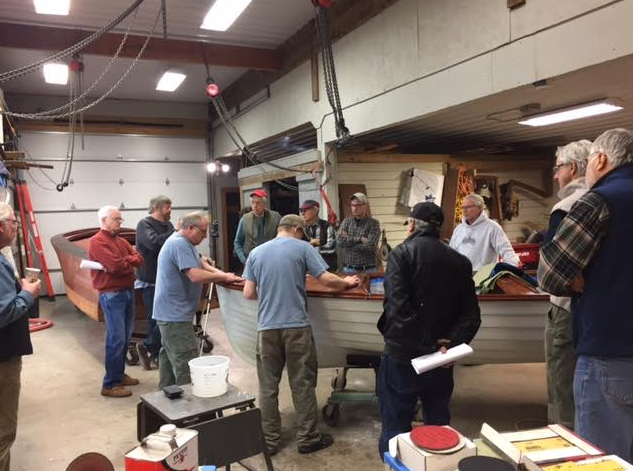 As about 20 LCACBS members were gathered around the Lyman, Mike Claudon was filming and narrating the entire process and will be available on his Youtube site and hopefully our website. Our LCACBS chapter renewed John’s and RJ’s membership to ACBS and our chapter. Our thanks to Mike, John and RJ for the workshop.